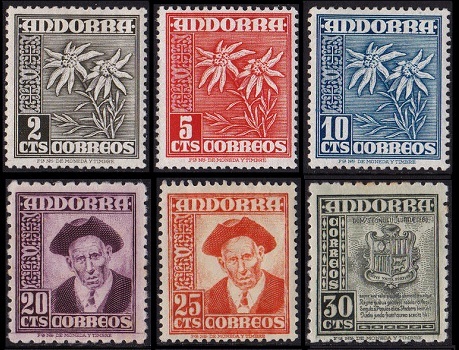 The number of Spanish Andorra stamps issued between 1948 and 1966 is actually rather conservative. The two relatively small sets of pictorial definitive Spanish Andorra stamps, issued between 1948 and 1964, feature national symbols and landscapes, and a special set of four definitive stamps issued during 1966 features flowers. In total, only 27 letter postage and special services stamps were issued, during this eighteen year period! The first airmail stamp of Spanish Andorra and the last special delivery stamp of Spanish Andorra, also issued during this period, are included in the column at the right. 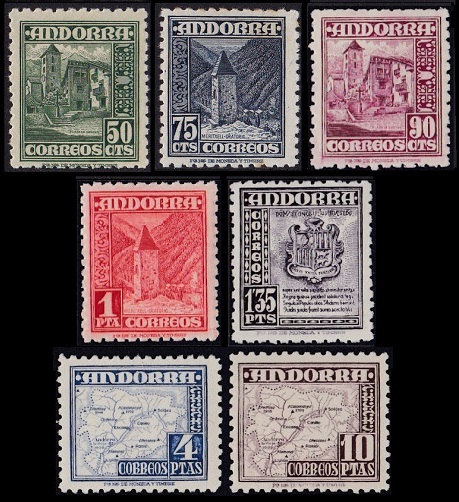 The eleven pictorial Spanish Andorra stamps shown above were issued between 1948 and 1953. The first three denominations are photogravure, and the rest of the denominations are engraved. Three different perforation gauges were used. 02 C. (1951 - Sc. #37) - Edelweiss. 05 C. (1953 - Sc. #38) - Edelweiss. 10 C. (1953 - Sc. #39) - Edelweiss. 20 C. (1948 - Sc. #40) - An Elder Provost. 25 C. (1953 - Sc. #41) - An Elder Provost. 30 C. (1948 - Sc. #42) - Coat of Arms. 50 C. (1948 - Sc. #43) - Plaza of Ordino. 75 C. (1948 - Sc. #44) - Chapel of Meritxell. 90 C. (1948 - Sc. #45) - Plaza of Ordino. 01.00 P. (1948 - Sc. #46) - Chapel of Meritxell. 01.35 P. (1948 - Sc. #47) - Coat of Arms. 04.00 P. (1953 - Sc. #48) - Map of Andorra. 10.00 P. (1951 - Sc. #49) - Map of Andorra. 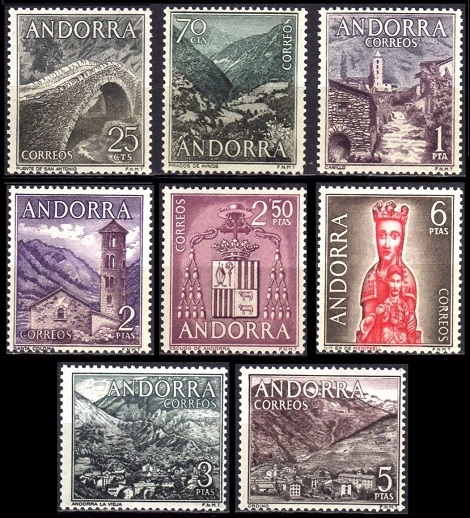 The eight pictorial Spanish Andorra stamps shown above were issued between 1963 and 1964. They are engraved and perforated 13. 25 C. (1963 - Sc. #50) - Pont de la Margineda, the arched Romanesque bridge, located in the parish of Andorra la Vella, near La Margineda, Andorra. 70 C. (1963 - Sc. #51) - Aynos Pasture, Massana Parish, Andorra. 01.00 P. (1963 - Sc. #52) - View of Canillo. 02.00 P. (1963 - Sc. #53) - View of Santa Coloma. 02.50 P. (1964 - Sc. #54) - Coat of Arms of Andorra. 03.00 P. (1964 - Sc. #55) - View of Andorra la Vella. 05.00 P. (1964 - Sc. #56) - View of Ordina. 06.00 P. (1964 - Sc. #57) - Statue of "Our Lady of Meritxell". The Romanesque statue, in the Sancturary of Santa Maria de Meritxell, was destroyed by fire in 1972. A replica is now in its place. 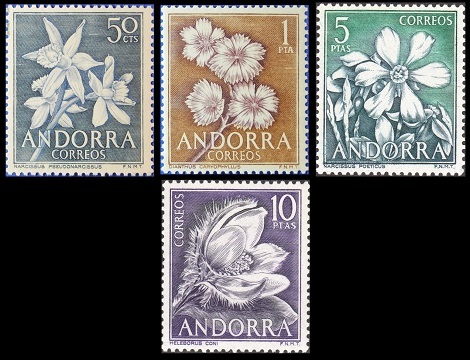 The four flower-themed stamps of Spanish Andorra shown above were issued on June 10, 1966. They are engraved and perforated 13. 50 C. (1966 - Sc. #58) - Narcissus (narcissus pseudonarcissus). 01 P. (1966 - Sc. #59) - Pinks (dianthus caryophyllus). 05 P. (1966 - Sc. #60) - Jonquils (narcissus poeticus). 10 P. (1966 - Sc. #61) - Hellebore (helleborus coni). 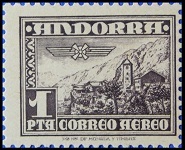 The 1 P. denomination Spanish airmail stamp of Andorra shown above (Sc. #C1) was issued on June 27, 1951. The design features an airmail emblem above a view of Andorra la Vella. The 25 C. denomination Spanish special delivery stamp of Andorra shown above (Sc. #E5) was issued during 1949. The design features a Coat of Arms and a Squirrel.